This morning, I wanted to do something without the computer and focus on speaking. I didn't want any major preparations, just some simple activities to get them speaking. We are studying "I want to pick apples. ", grade 5. So here's a fun activity that worked well. Similar to my Tic Tac Toe class. "A: Hello, my name is __________. " A big dice works best! This is a super simple way to practice speaking and it's a great warm up or closing activity. You'll need a board and 1 dice. Divide the class into 2 teams (Boys and Girls works well). Next, write your dialogue, with blanks, on the board - very simple, 2-3 sentences is enough. You can have 2 sets of dialogue, this works well with older/higher levels. 1 set for the lower level is fine. My dialogue, according to my lesson, I Want To Pick Apples, grade 5, Korean textbook. 1. A: What do you want to do? B: I want to ____________. 2. A: Do you want to ____________? 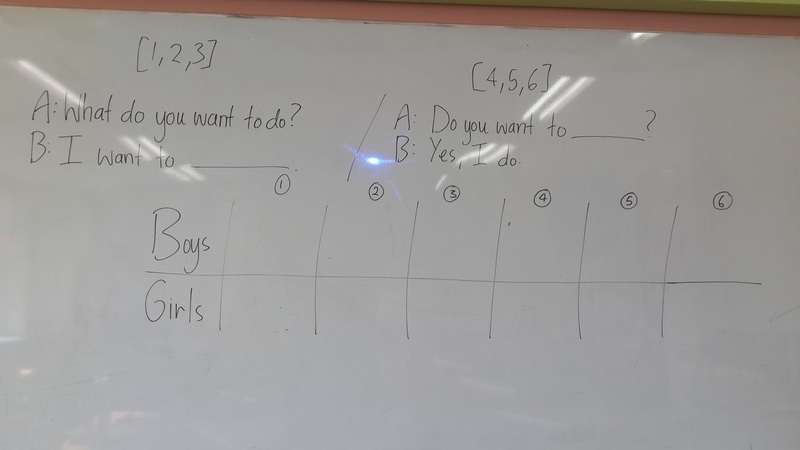 Draw a table on the whiteboard with 2 rows and 7 columns. Column 1 is for the team names, the other is going to be filled with help from the 2 teams. 1 Row for each team. You'll notice, above my 2 sets of dialogue I have 3 numbers in brackets - this is so the students read the set dialogue that corresponds to the number rolled on the dice. 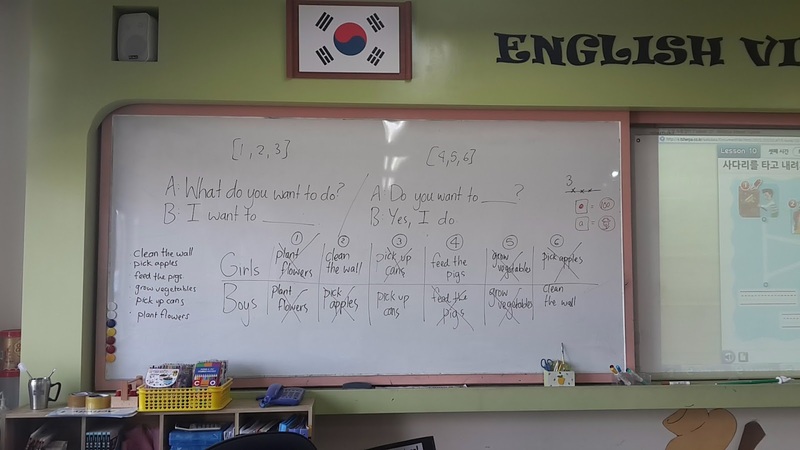 Now, when the class comes in, go over the key sentences and fill up the table with their help. Teacher: "Choose 1 sentence to go in the box, it's random - bingo game!" "Boys - what sentence do you want for box 1?" Teacher: "Girls - what do you want for box 1?" The students will eventually get that they can pick any sentence end they want for their team bingo line. Once the table is filled, you can start the game. Have the first player come up and roll the dice. If they roll a 1, they should read the dialogue and fill in the blank according to the sentence end that is in the number 1 box. The teacher should mark an X through box 1 after the student reads the correct dialogue. It's good if you have the class read part B and the player read part A (of the dialogue). The first team to get 3 X's in a row, wins! Teacher: Minho, roll the dice, please. Class: "Do you want to grow vegetables?" Teacher: "Great, now I'll mark X on box 5." Okay, Yuan, roll the dice, please. Class: "What do you want to do?" Yuna: "I want to plant flowers." Teacher: "Great, now I'll mark X on box 1"
So Minho, on the boys team scored a 5. Which means they need a 6 and 4 to get 3 in a row to win the game. Yuna rolled 1, so they need a 2 and 3 to get 3 in a row to win. Here's what my board looked like after a few rounds - we actually had to play it twice during class as they didn't manage to get a 3 in a row in the beginning. But by the end of class the girls won! It was a real hit, class loved it. See how the jobs are all different and not repeated? That works fine. You just need to follow the dice. Class: "What do you want to be?" Minho: "I want to be a pianist." Hope you're able to make use of this simple speaking game! You can play it with big or small classes and adjust it accordingly. Just a quick question because I'm thinking about using this in my classroom. How did your students not get 3 in a row during the first round? Is there a limit on dice rolls? I'm just trying to make sure I understand the game before I try it out myself. Thank you so much for sharing it!